Currently, there is an unprecedented and persistent harmful algal bloom (HAB) impacting both coasts of Florida .The Florida HAB organism, Karenia brevis (commonly known as red tide) creates a toxin that is threatening to organism health. 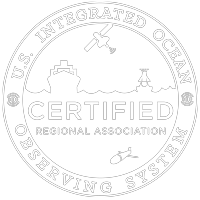 Southeast Coastal Ocean Observing Regional Association (SECOORA) supports observing and modeling work to track the bloom. SECOORA is working to more broadly share data resources on red tide here. Once a bloom occurs, it is important to know where the bloom is going to travel. People need to decide which beach will be affected and which will not. SECOORA supports ongoing modeling work at the University of South Florida (USF) College of Marine Science to help forecast the bloom’s next location. Pictured left is a view of the USF model that provides short-term (4.5 day) HAB trajectory forecasts for the Tampa Bay, Florida. Pictured right is a buoy being serviced off the coast of Florida. The buoys are managed by USF Coastal Ocean Monitoring and Prediction System and supported by SECOORA and IOOS. Images credit to USF CMS. The USF model is a nowcast/forecast that provides short-term (4.5 day) HAB trajectory forecasts for the west coast of Florida. Results are provided for both the surface and the near bottom. There is a higher resolution forecast for the Tampa Bay Region. This work relies on observations of oceanic and atmospheric conditions to get the forecast right. The HAB trajectory modeling is conducted by Dr. Bob Weisberg and his colleagues at USF in partnership with Florida Wildlife Commission. SECOORA funds buoy and coastal station operations on the West Florida Shelf collectively known as the USF Coastal Ocean Monitoring and Prediction System. This system maintained by USF Drs. Bob Weisberg and Mark Luther provides information on real-time surface meteorology, currents and water level. These observations are critical input for the HAB forecasts. In addition, SECOORA member Mote Marine Laboratory has designed a user-friendly app that provides beach condition reports from select beaches on the southwest coast of Florida and the Florida Panhandle. The app will alert you when dead fish are present, whether there is respiratory irritation among beachgoers, provide water color, the wind direction, and what flags are currently flying at the beaches (for lifeguard-monitored beaches).